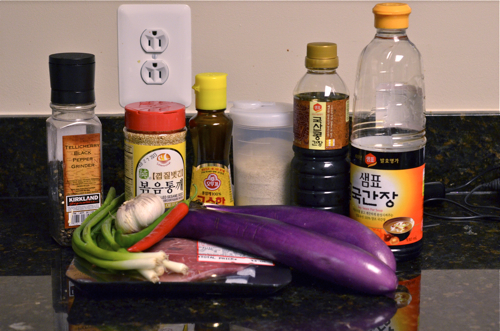 You are here: Home > Archives > Recipes > Easy and Simple > Beef with Eggplant, This is not a stir-fry! 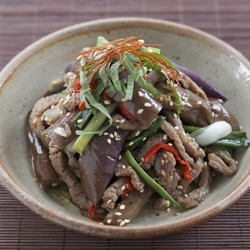 Korean foods are well known for its healthiness. It is not only because we do eat lots of vegetables with meal but also the cooking method we use to prepare the dish. 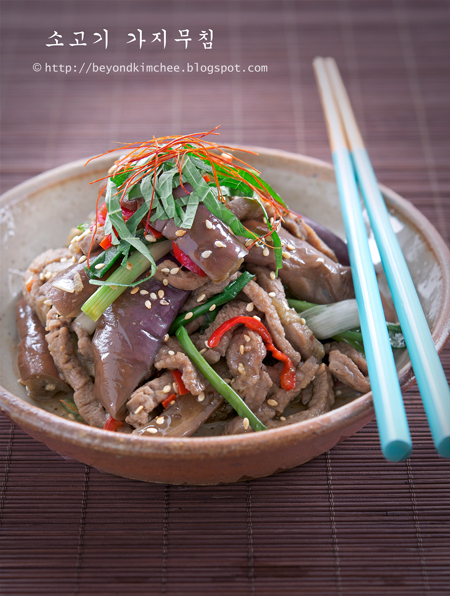 Stir-fry is perhaps one of the most popular cooking method in any Asian cuisine (of course Koreans do use that method in various dishes) but it is not the most common or popular way in Korean cooking to be honest with you. 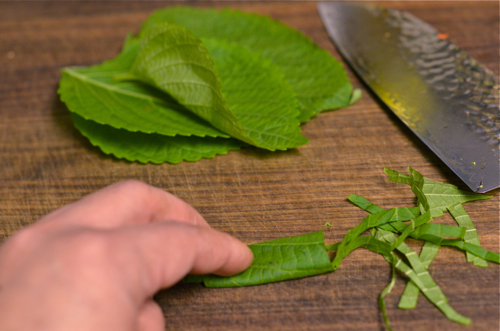 “Muchim (무침)” is a skill to master in order to understand the Korean cooking. Muchim involves some steaming and serious tossing, therefore no oil is necessary to cook the ingredients yet creates wonderful flavor balance without adding the extra fat in the dish. So here is one dish that I would like to share with you. This is NOT a stir-fry. There is no oil involved in cooking process except a tiny bit of sesame oil for flavoring the dish. Here are your helpers of the day. 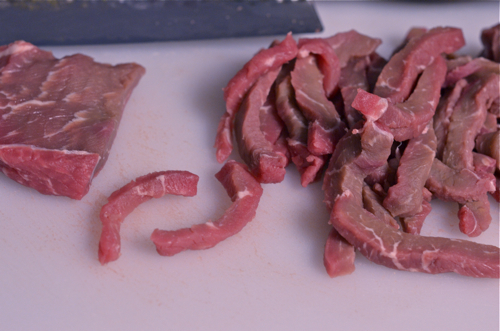 Slice beef into 1/4″ matchsticks. 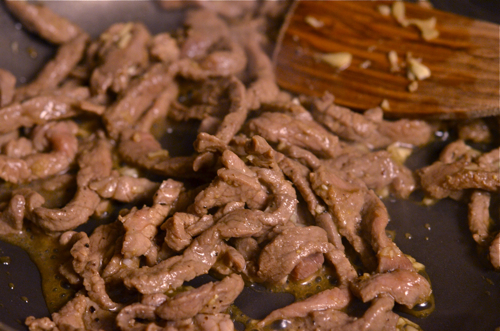 Toss beef with soy sauce, sugar, rice wine, pepper, and sesame oil. Set aside to marinade. Cut into 4 section and slice each section into 4-8 wedges depends on the thickness. 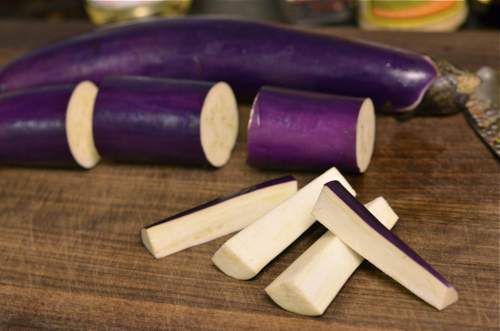 Important: It has to be Asian eggplants. They are slender and longer than Italian or other kind and very tender when cooked. 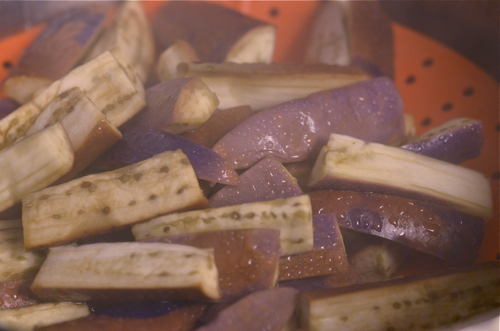 Steam your eggplants for 5-7 minutes until soft and tender. They will change color slightly. Transfer them to a mixing bowl. DO NOT RINSE! 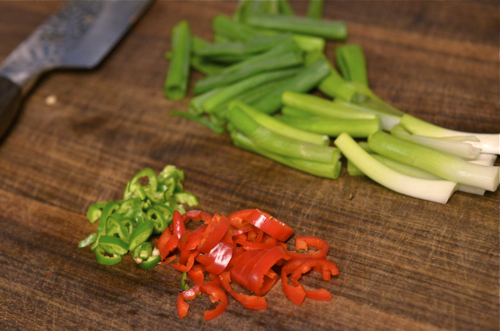 Meanwhile slice your green onions and chilies. I like to add chilies (seeded). I like things with extra kick! 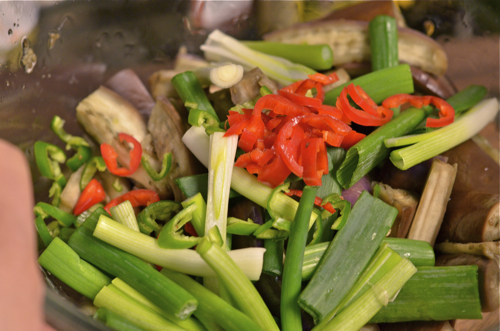 Dump the green onion and chilies in the mixing bowl with eggplants. Now, let’s cook up the beef. Heat your skillet over medium-high heat until very hot. Add the beef and just toss until they are brown, about 1-2 minutes. Do not overcook. Remember, NO OIL is needed! They will cook in their own marinade. Quickly add the beef in the bowl with eggplants green onions. The heat from the beef will wilt the green onions to be soft. Add Korean soy sauce, more sesame oil and my secret ingredient, the shrimp powder (optional). Now, Use your hand and start tossing as if your are gently massaging them all around. This technique is called “Muchim”. The Korean way of tossing things to flavor ingredients with seasoning. I had these 깻잎, Kkaetnip, the paella leaves (aka sesame leaves) as garnish. This will add a wonderful fragrance to the dish. Their fragrance is like between basil and mint, yet unique on its own. You don’t have to if you can’ find them. But adding some fresh mint would be a nice touch. 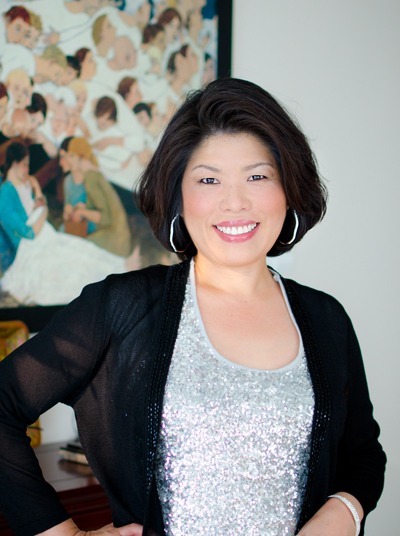 Looking for quick yet healthy dinner with hint of Asian touch? Then this is the dish for you. Just a hot bowl of brown rice and Kimchee on the side is all you need. 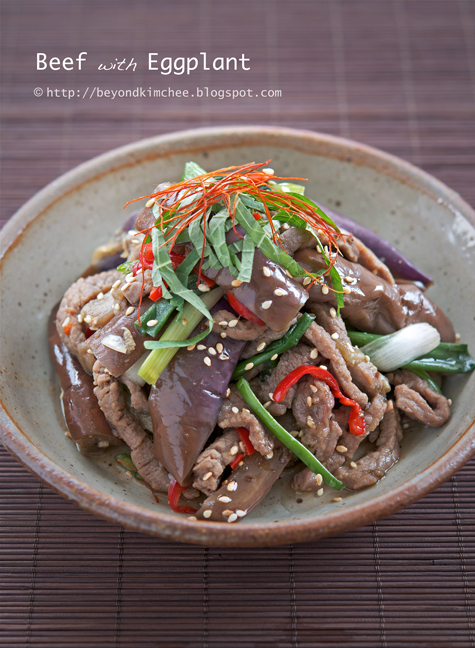 In a bowl combine beef slices with soy sauce, sugar, rice wine and 1/2 tsp sesame oil. 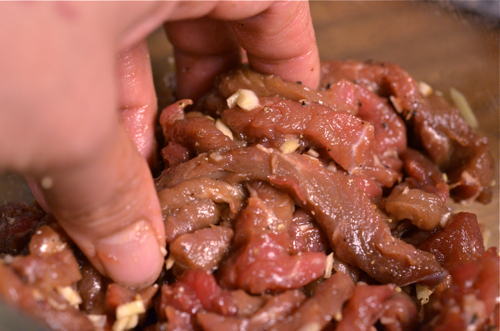 Toss well and set aside to marinade. Cut eggplants into 4 sections lengthwise. Cut each section into 4-8 wedges depends on the thickness. Put them in a steamer and steam for 5-7 minutes until soft and tender. Place hot eggplants in a large mixing bowl and add the green onion and chilies on top. Set aside. Heat skillet over medium-high until very hot. Add the beef and toss to cook them until brown, about 1-2 minutes. Do not overcook the beef. 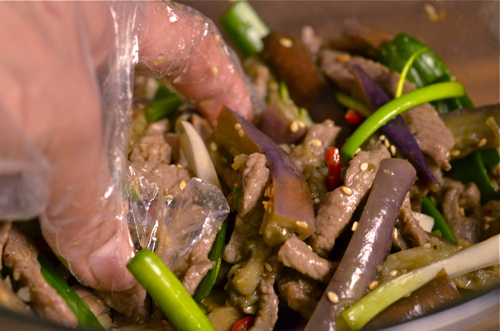 Add the beef into the mixing bowl with eggplants and green onions. The heat from the beef will wilt the green onions. Add the 1 tsp sesame oil, Korean soy sauce, pepper, sesame seeds, and shrimp powder (optional but adds very nice flavor) to the mixture. Using your hand, toss them together while gently massaging them around. This will help to soak the seasoning into the ingredients. Serve warm with rice and kimchee on the side. You are good to go! this looks really good! and i have not yet made any kind of muchim before--so i should really try this out! This looks great. I love recipes like this! Beef and eggplant make a great combo. I love this! Totally delicious and also quite simple to make :) Thanks for sharing! I never knew about this 'muchim' method! it sounds really interesting i'll try this next time instead of stirfrying! I love eggplants. Can't wait to try this recipe! garlic with beef during marinade and cook together later. Annyeong hasaeyo, Are there any other sides you can serve with it? 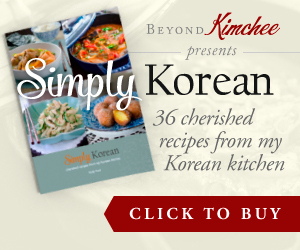 What sort of kimchi goes best? Any vegetables (i.e. fresh cucumbers, baby carrots), that go well with it? Look forward to making it! Kamsahaeyo, Feather Stone. The dish itself is served as a side dish in Korea but you can definitely serve over rice and eat as a one dish rice bowl. I would serve with any kind of kimchi (either cabbage or radish kimchi) or even spicy Korean cucumber salad would be nice as well. Hope you can give this dish a try. It is tasty and healthy, which I always look for... Thanks.